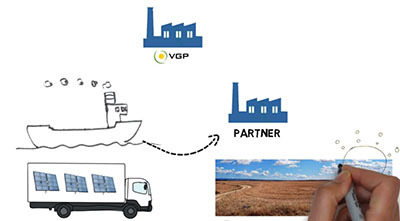 We introduce our innovative production process for the CPVRS system. The CPVRS system is a photovoltaic concentration system that reaches a 30% DC system efficiency. Its production is based on a distributed manufacturing paradigm. In other words, systems assembly is carried out in the country where it will be installed by a local partner. Becoming a partner is so easy. You don’t need a large infrastructure neither experience in the production of PV system, you will be responsible for the following activities. Assemble CPVRS systems at your facilities. Install CPVRS systems on the field. In the video below you will view our production process, which represents an innovation for solar energy systems.